Problem – Wet spots appear where there are no plants. Fine dirt is coming to the surface at wetted areas. Drip emitters spurting water and not dripping. Water is not getting to every plant. Diagnosis – Drip emitter lateral tubing has been punctured or cut. The ¼” tubing barb end has pulled loose from the emitter lateral tubing. Drip emitters are partially clogged and are not operating properly. Drip emitter is missing at plant location and water is spraying out of the ¼” tubing. Drip tubing is being constricted so water flow is reduced. 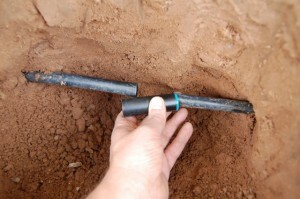 Repair Remedy – Excavate wet area and locate leaking tubing. Cut out damaged portion and reconnect using a compression fitting coupler. Locate hole in lateral tubing where ¼” barb was plugged in and seal with a goof plug. Using a drip emitter tubing hole punch, create a hole in the emitter tubing sidewall and reinstall the ¼” barb fitting with ¼” tubing. Replace any missing drip emitters with the same type. Check for kinks in tubing and replace with rigid fittings. For spurting emitters, tap the hole to see if that will clear any debris. Replace if it does not start dripping again.